Hi there, CEO Olivia here. Today I want to bark about the benefits of apple cider vinegar. There are humans that begin every day with it. Many swear it keeps them healthy. I was curious if it’s good for us dogs. Turns out it is. On the pH scale, water is neutral at 7.0, tomato juice is acid at 4.1, distilled white vinegar is more acid at 2.4, and the pH of lemon juice is 2.2. Apple cider vinegar tends to be less acidic, with a pH between 4.25 & 5. Some popular brands, such as Bragg, Spectrum, Eden Organics, Solana Gold Organics, & Dynamic Health, are made from organic apples that are crushed to make cider, then aged in wooden barrels. Apple cider vinegar is raw & unfiltered, so it’s not clear like distilled vinegar. Instead, it contains a dark, cloudy substance that resembles dusty cobwebs. This substance is called the “mother” or “mother veil,” & consists of naturally occurring pectin & apple residues whose protein molecules are connected in strand-like chains. The presence of the mother shows that the vinegar contains active enzymes that processed vinegar doesn’t have due to over-processing & filtration. Nearly all of apple cider vinegar’s human uses can be applied to good dogs. Many natural health experts prefer raw organic apple cider vinegar for topical applications, including muscle aches & bruises; sunburn, abrasions, insect bites, & stings. It’s also very good for our coats & can be an effective treatment for hot spots. –After shampooing your dog, give a final rinse with 1 cup vinegar diluted in 2 to 4 cups water. Experiment with different dilutions for best results. 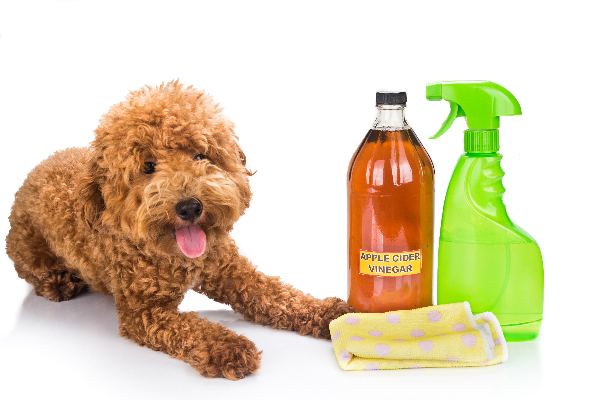 -Reduce your dog’s dander by massaging full-strength cider vinegar into the coat before shampooing. Apple cider vinegar can help keep a dog’s ears clean & healthy too. Place a few drops on each ear & gently massage, or apply with a cotton swab. For a more medicinal ear drop, make or buy a cider vinegar tincture containing ear-friendly herbs like garlic or mullein blossoms. So, is a daily dose of apple cider vinegar good for your dog? Unless your dog is allergic to apples, he or she isn’t likely to suffer a serious reaction, & within a month you should be able to tell whether it’s helping. You should see improvements in skin & coat condition, less itching & scratching, increased mobility in older dogs, reduced flea populations, & an improvement in overall vitality. A simple tablespoon of apple cider vinegar & raw honey a day could be enough to show marked improvements in the quality of your dog’s health. Suzie Q & I both get a daily dose of Apple Cider Vinegar. HuMom says it makes our coats thick, soft & we smell really nice. Have you tried it for your good dog? That is very interesting! I’ll have to give it a try. I’m sure you will be pawfectly pleased. Wow, I had no idea. This is pawsome info!